Home » Review » Pump Mode Review: Dirt Cheap Solution For Nitric Oxide Boosters? Pump Mode Review: Dirt Cheap Solution For Nitric Oxide Boosters? Even though the majority of good nitric oxide boosters are priced significantly higher than the one we're featuring today... I sincerely doubt they're much better than it in terms of effects and actual results. Meet an under $20 NO booster called Pump Mode. 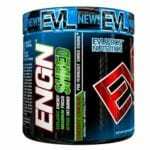 It's made by Evlution Nutrition, a brand known for aggressive prices and great supplements. What can their NO booster do for you? Well, that's exactly what you can find out by reading the full Pump Mode review down below! Due to their extremely beneficial and efficient content, pre-workouts have become one of the most popular dietary supplements on Earth. The main function of such a supplement is the improvement of athletic performance, allowing you to train at your best for the best possible results. Most of the pre-workouts available today are based on nitric oxide creation, giving your body everything it needs for muscle growth and strength enhancement. In this review, we will be taking a look at Evlution Nutrition NO booster called Pump Mode. Not only it is great for improved performance, but also improves vascularity and supports intense pumps. With all that in mind, it is great for anyone having trouble keeping their energy, focus, and strength at a high level throughout the workout. It is designed to help you make that extra few reps that really sets your training apart from regular or easy to high intensity. What's inside this supplement? Are Pump Mode's ingredients top quality? Although at first look it may seem Pump Mode has poor ingredient content, it couldn't be more false. Evolution Nutrition created simple formula capable of doing a lot for your body, allowing it to function the way it is supposed to. A glycerol-based patented formula designed to take your pumps and performance to another level. It is also recognized for its excellent endurance enhancing properties, muscle hydration, greater muscle fullness, regulation of body temperature, and much more. Due to its positive effects on blood flow and vascularity it has a perfect role in prolonged exercising. Just like HydroMax, it promotes great pump and provides you power necessary for a successful training session. Pump Mode by Evlution Nutrition just as its name suggests is oriented mostly towards improving pump and blood flow. It is clinically dosed and despite having only two major compounds (except Vitamins C and D) manages to deliver much more than you would expect. It is definitely a pleasant surprise and we are looking forward to seeing what is the next creation coming from their labs. Are there any side effects associated with Pump Mode? The risk for your health with this one is pretty low. We had a hard time finding negative review talking about the side effects. It is a relatively popular supplement, so lack of such a reviews definitely makes a good statement regarding this issue. Few minor side effects, such as bloating or nausea are the only problems you should worry about. However, if you experience some major negative changes in the way your body functions, make sure to contact your doctor. What do other users have to say about this product? Are there any Pump Mode reviews out there? Almost 90% of the customers on Amazon gave it a five-star rating. You cannot get a clear picture of the value and efficiency of the product based on a single or a couple of experiences, but such a huge percentage of positive comments considering there are more than 200 reviews, does tell a lot! Every single one of us that shares a certain passion for the supplements and workouts in general, have experienced a disappointment with a single product or even a certain type of supplements in the past. Luckily top notch creations such as Pump Mode can open our eyes and show us the real value of such a product if done properly. Final thoughts on Pump Mode? Pump Mode may not have the versatility some other pre-workouts have, but it does the job it promises with an extreme efficiency. It is definitely something we appreciate and hope to see from many other products and dietary supplementation companies in the future. Its main mission is to improve blood flow which ultimately results in numerous benefits you can notice both in and outside of the gym. If you are looking for an amazing pump, followed with an energy boost, enhanced endurance, and overall better performance, this one just might be the perfect choice for you. We recommend it to anyone in search for a phenomenal nitric oxide booster for a great price and with a ton of positive reviews. Order a bottle of Pump Mode here for $14.24! Where to buy Pump Mode? Unfortunately, it isn't easy to get your hands on it at a local sports equipment and supplementation store. However, if you think this one is the perfect addition to your diet and will help you get to your goals make sure to check it out on Amazon for a great price and fast delivery. A proprietary blend of glycerol and silica. HydroMax is capable of making a real change when it comes to pump and vascularity. It is great choice for athletes looking for easier weight management, improved exercise performance, hydration, and much more. There is little to no research available for this formula. A patented form of Betaine Nitrate in 65~35 ratio. It is neutral flavored (without flavor) just as HydroMax. Although in smaller amount compared to betaine, nitrate is the component doing majority of the work. It comes in a great dose and will have a positive impact on blood flow, power, endurance, energy, and pumps. An abdominal gas swelling resulting in stomach pain and discomfort. If you experience such a side effect it is most likely caused by the HydroMax content. Unpleasant feeling in the stomach with an inclination to vomit. Both major compounds of the mixture are capable of causing this side effect. How much does Pump Mode cost? Like we already stated above, Evlution Nutrition is known for their insanely cheap supplements… and Pump Mode is no different. You can get this thing for as low as $14 which is a proper steal if you ask me. Yes, Pump Mode's ingredients are known for its nitric oxide boosting properties. In addition to that, there are also those which increase athletic performance and provide a good boost of energy… all of which is of crucial importance for successful workout sessions. Pump Mode is best bought via Amazon. We are talking about the biggest and safest online marketplace that makes no room for scammers! Can women use pump mode? Invictus by Iron Legion Review: Can This Unconventional Supplement Help You Get Rid of Stress? DNA Dispatch Review: Could This Be The Next Big Thing? Sheer NO Review: Is a Firm NO The Only Answer To This Supplement?